Facebook Embedded Posts are now available to everyone. Anyone can either manually embed the posts from or use official WordPress Plugin for precise control. Unlike Twitter Embedded Posts, about which we wrote many a times, in fact just today; Facebook Embedded Posts for WordPress is practically very easy. Definitely, Twitter Embedded Posts has many other features and possibly should not be compared because the usage style of Twitter and Facebook is fully different. It is practically very easy to use Facebook Embedded Posts. First method is to embed a post, is by hovering over the down arrow on the top right of the Facebook post. Only public posts from Pages and Facebook users can be embedded. If the post is public, click the “Embed Post” option in the drop down menu and from the dialog that pops up, simply copy and paste the code provided in to WordPress post (Text/HTML mode) or anywhere you want. Post by The Customize Windows. This Article Has Been Shared 6554 Times! Add a Print Button in Genesis powered WordPress website in just few steps. You really need not to be a coding expert – its amazingly easy than you can think. Schema.org is a Schemas for Structured Data Markup for creation of more easy semantic web which can be visualized form which fills the human-computer gap. 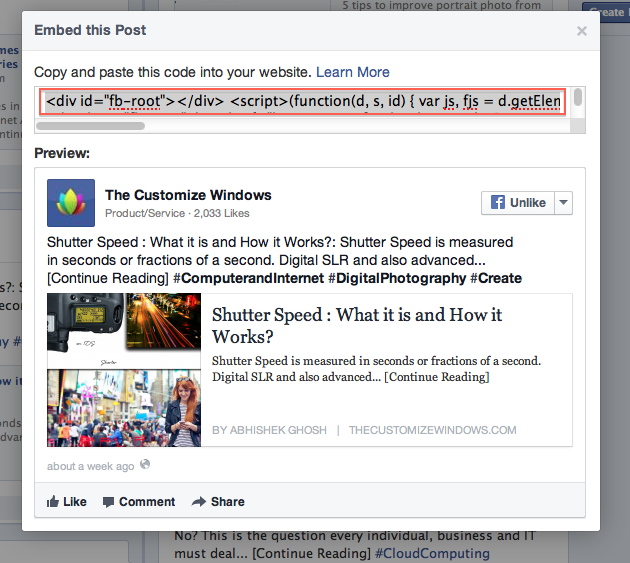 Cite this article as: Abhishek Ghosh, "Facebook Embedded Posts for WordPress Guide," in The Customize Windows, August 22, 2013, April 21, 2019, https://thecustomizewindows.com/2013/08/facebook-embedded-posts-for-wordpress-guide/.